I’ve finally got round to shooting four jackets that were made in the past year. Over the next week I’ll do a post on each one, and while there is no intention to make direct comparisons – that would be largely pointless, given that they are such different styles – it will be interesting to do them in series. The first, here, is my first jacket from Solito. I’ve written a little before about Gennaro Solito and his son Luigi, who does the international visits, and there is little to add about the style. It is a classic Neapolitan cut, with shirt shoulder, minimal padding and beautifully drawn patch pockets. 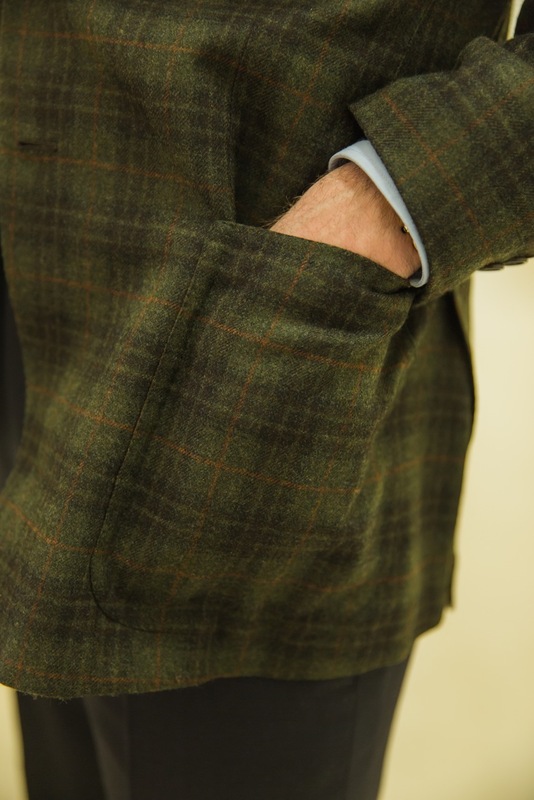 The cloth is from Caccioppoli and the jacket is quarter lined inside. It is worth emphasising the price, though, with suits starting at €2000. That’s a lot less than Rubinacci or Caliendo, and the result both in terms of fit and make is superb. The only thing we had to change at the final fitting was the length of the sleeves, which Solito tends to cut quite short. And I forgot to ask for horn buttons rather than corozo, but we can swap those later as well. Solito has just starting visiting London with another Permanent Style favourite, shirtmaker Satriano Cinque. They had their first trunk show in London a couple of weeks ago. Solito visited previously, but infrequently, and Satriano had never been before. They have also just confirmed their next dates – May 17 and 18. All arrangements and contact details as on the last post on their visits. Shoes by Cleverley, trousers by Caliendo, sweater by Johnston’s. You can follow the discussion on Solito jacket by entering your email address in the box below. You will then receive an email every time a new comment is added. These will also contain a link to a page where you can stop the alerts, and remove all of your related data from the site. simon, another thing is, why is solitio cheap compared to the competition? i gather that he doesnt have a flash atelier so this may account for some savings but is the make the same quality as other better know napolitan names seen on various fora? Would you mind commenting on the quality of Johnstons knitwear. I haven’t come across them before but their prices seem very competitive. I love EVERYTHING about this jacket. Superb! Beautiful green jacket, Simon! I hate to stick with the issue of price, but I am quite mystified at how a Cifonelli or Huntsman can start at 5000 euros and proceed upward, and then a quality tailor like Solito begins at a far lower number. Are the bespoke prices at Solito simply too low? The difference in construction or quality cannot be that great. I think the price comes from the fact that those you are mentioning live in big cities where prices are so high. Another reason is that they spend a lot of money in publicity and marketing. In Naples there is a tradition on the Sartoria and people do not care about it. I think Solito and Mimmo Pirozzi in via Chiaia are reasonably the last true tailors remained here in Naples, in my opinion. Really? I’ve tried Caliendo and they were excellent. One thing to consider on price is demand. Some brands have more demand based upon reputation rather than quality or amount of handwork. Price reflects that. Perhaps Solito could charge more, but if they are not operating at capacity now, it would probably cost them in terms of total receipts. A&S charge a lot more than Steed and EnglishCut which are two of the more famous former A&S cutters. Part of that is that A&S probably workshops in London, whereas the others do their tailoring in the country to a great degree, but also because A&S is the name and attracts a lot more demand based upon that alone. Simon, I’d be interested in knowing how Panico compares to the other Neapolitans you’ve tried. Might that the subject of a future post? Simon I would be delighted to take you or anyone to Mimmo Pirozzi next time you’re here. Napoli has got a tradition as said and generally the quality is higher than anywhere else in my country. The problem is when you talk about “confezione” which is something similar to what you call “ready to wear” and real “sartoria”. In the real sartoria the cut comes without using papers or similar things; the tailor is still the cutter; when inside the lining there are enough amount of hand sew things then we have a proper tailor and not a “ready to wear”. When you become fatter or thiner the jacket is still your jacket: this depends not from the side but from the collar and the shoulder. All the things like handmade holes or manica a camicia and whatever are nice things and they come naturally if the collar and the shoulder is done properly otherwise thay are only a good things for marketing purposes. To be honest from what i see around, i talk always in my country of course, very few can be titled real tailors. Could be one of your best, alongside Caliendo. Looking forward to more pics and an evalutation. Really nice cloth, superb style and fit. 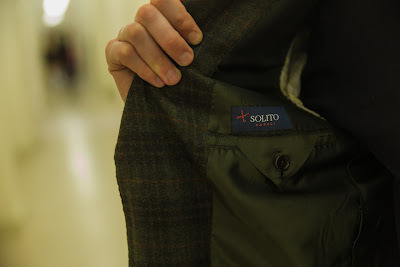 The jacket by Solito is beautiful, and the fit on the Caliendo trousers is perfect. Did you request no break, or a very slight one on the trousers? Did you ask for a particular cut? They look slim, elegant, and flawless. Simon, may I ask what Luigi would charge for a CMT jacket please? I have some material I would like to commission. Something’s off about the shoulder and neck. Otherwise nice. Can’t say that I approve of this at all, an ugly cloth I personally think (but great trousers). Also Simon this and the post above, are they really what you would call ‘permanent’ style? My test for that is if I would have liked to have it handed down from my father and if my children would like it handed down by me. Do these two pieces count? Yes it was, but that was largely because Luigi was travelling very infrequently – it was the trips rather than the work that was the problem. Now Luigi is in London every month or two, as I mentioned (including in a couple of weeks), it will be much quicker. On this old post you commented on he lead time for Solito. Do you know how long is it currently taking from commission to delivery of a first jacket for your readers who live in NYC? Love that Solito jacket! I’d like to go to Naples and get fitted there for a suit and sportcoat from Solito and some shirts from Satriano. Where would you recomend staying? Good idea. I usually stay with friends I’m afraid so I can’t recommend anywhere. There are some decent hotels though. Simon, You’ve mentioned you will do posts on Solito jackets but I cannot find then. Have you done those reviews in the end? I will be travelling to Naples in December for my first foray into the world of bespoke suiting. After having read extensively about neapolitan tailors, I have narrowed my options down to either NSM or Solito (costs in mind as I am a student). With your experience, could you highlight some differences between the two house styles, and perhaps comment on the quality of the construction as well? Quick note on travelling to Naples – it won’t be easy meeting that many craftsmen if you don’t speak English. NSM and Solito both travel as well. Still a lovely city to go to though. In what aspects are the finishing not so perfect? I understand that Luigi travels, but you mentioned before, it might be better to head to Naples for the first time? I suppose this is for Signore Gennaro’s input (no offence at all to Luigi) on drawing the pattern? Sorry to add to the confusion, I just saw Pirozzi in London today and i thought his workmanship might be slightly better than Solito’s, what do ya think? The price works out to be the same in the end, do the two houses differ in style? I’m thinking of getting a jacket made by Solito. What’s the view on his finish? I’ve read that it’s not that great. Perhaps have a read on my various posts on Solito. Yes, it’s not the best. But then the price is good for that level of cut. Thanks for the response. Would you say that the finish is better than that of Graham Browne? Good question. I’d say just below. Thanks for your honesty. I guess I’ll give GB a try. By the way, excellent website! They are very different styles by the way. I would pick on that basis, rather than make. I’ve read that GB will do a soft tailored jacket. I like the look of the Neapolitan jacket. However, I would prefer it to be cut closer to the body. I’ve no previous experience of a Neapolitan jacket but my concern is that an Italian tailor would cut a looser fitting jacket. PS Due to your previous posts, I’ve had a shirt made by Luca Avitabile. The fit has been incredible. However, the hand stitching has not been too cracking. I see. I guess it would be have been easier to state exactly what I was looking for. Essentially, a jacket that is to be worn casually (with jeans or chinos). I’d like for the shoulders to follow the natural shoulder and be slim fitting in the body and sleeves. Based on this, which tailor do you think would be the best option? Ps Thanks for all replies so far. Quick question is this a 3 roll 2 or a two button? I’ve just started on my first solito jacket and was intending to go 3 roll 2 as the house style but am now thinking two button might be better. Thanks Simon, I’ll stick with 3 roll 2. Is this the same brand – http://www.sartoriasolito.it/. Ballpark cost of bespoke suit and I assume done over multiple fittings? About £2500 for a suit, and yes would require at least two fittings. You mention suit price but what do jackets start at? Simon- I had arranged for a meeting and fitting with Elia in Naples but he cancelled one week before. So now thinking of going to Solito. You had said that Solito is not as good. Is it worth getting a suit from him? Reading your blog was invaluable on the extensive research that led to my first bespoke commission, a navy suit by a London tailor. Thank you. I am very pleased with the results and will write a post on the appropriate place. I am now ready to take the plunge and commission a Neapolitan jacket. I live in NY and so have fewer options but am leaning toward Solito who will be here later this month. However I have read some comments on other forums about fit issues, long delays and lack of responsiveness. It seems your experience has been good but I was wondering if you could offer thoughts about this from your conversations with others. I think Solito is good value for money, but yes I would say it isn’t always the best in terms of finishing quality, for example. Thanks for that Simon. How specifically does the difference in finishing between Caliendo and Solito. Luigi Solito is willing to meet me in Rome for the fabric selection and measurement. With Caliendo, he wants me to meet him in Naples. ( he had initially agreed to meet me in Rome). With both, I was going to meet them in Naples for 1st and 2nd fitting. 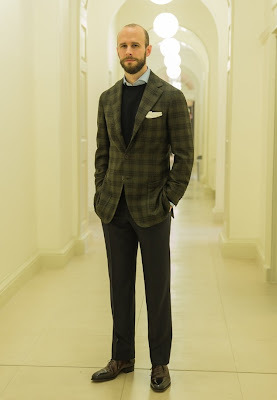 This is my first Neapolitan suit and cost not an issue as I pay the same as Caliendo for Zegna MTM jackets. Hi, Simon, just recently discover your blog, when searching for neapolitan style. Great blog, im enjoying a lot. I have a question, it is not related to the jacket it self, but to your nice fitting trousers. What is the secret to have this nice straight line, from the top to the bottom of the trouser, in a way that dont look to baggy? Im a slim guy (152 lbs), i don’t know if this can also counts in a straight line fit. Hi Gabriel, pleased you’re liking it.